Orange cuts ties with Israel, as Israeli embassy demands French authorities condemn statement of French Orange CEO. 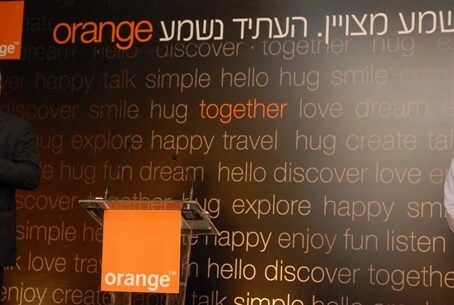 The French cell phone company Orange announced on Thursday afternoon that it has decided to halt its operations in Israel and end its partnership with the Israeli company Partner, which franchises Orange's name in Israel. The dramatic move comes as Israel is launching a political campaign in response to the insulting comments made Wednesday by Stephane Richard, CEO of Orange, in which he said he wished he could "dump" Israel "tomorrow," which he in fact did. "Orange doesn't want to continue to hold its brand name in countries in which it isn't the direct provider. Therefore, Orange is interested in putting an end to giving permits to (use) its brand name," read the Orange statement announcing the move. Partner issued a sharp response on Wednesday, and starting Thursday morning Israel's embassy in France has been taking action on the issue, and Israels' Ambassador has contacted the French Foreign Ministry and Finance Ministry demanding clarification. The Israeli Ambassador to France, Yossi Gal, expressed how seriously Israel views the comments of the French company's CEO, and called on the French authorities to condemn the remarks. "The embassy is working intensively with all the relevant sources to get immediate clarifications on the serious words, and is clarifying the seriousness we attribute to the issue," said Gal. In parallel to the embassy, several Jewish organizations in France have launched a wave of protest, with some of them urging French Jews to cut their service with Orange. Culture and Sports Minister Miri Regev (Likud) responded to the statements as well, calling on French President Francois Hollande to immediately fire Richard if he does not apologize for his anti-Semitic comments. "On the backdrop of the recent serious events in France, the French government must show zero tolerance for anti-Semitism," said Regev, referencing the growing wave of anti-Semitic violence in the country that was highlighted in January by a Muslim jihadist holding a kosher supermarket hostage in Paris and murdering four Jews. The minister added, "I call on Jews of France and the world to disconnect from Orange unless Stephane Richard takes back his words. The time has come for them to understand that Jews in the world and sane voices that oppose anti-Semitism and racism also have power." "It's important for me to note that the Israeli public must not turn Partner into a victim of this statement," she warned, referencing the Israeli Orange cell phone provider. "Partner is is an Israeli company that employs thousands of workers in Israel, and I wish to strengthen its management and workers."